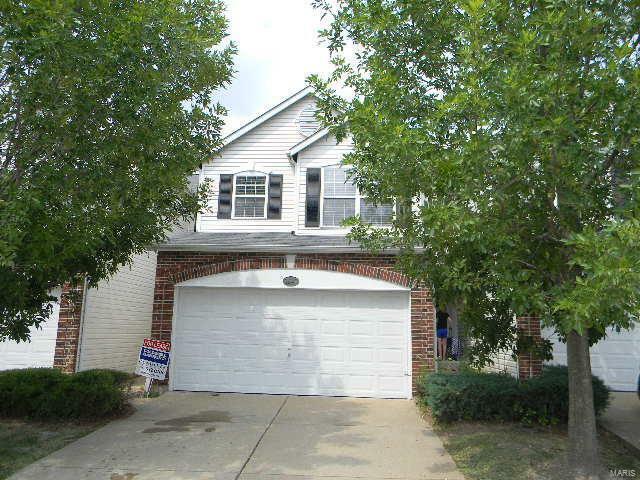 Cute 3 bedroom, 2.5 bath condo with TWO car garage. Walk into front door to open great room with gas fireplace. From there into kitchen with plenty of storage, breakfast bar and breakfast room leading to fenced backyard. Upstairs you will find master bedroom suite as well as two additional bedrooms, full bath and a SECOND floor laundry. Lower level is unfinished and has ample room for storage. Easy access to interstate. Ready for immediate occupancy. Grass cutting and alarm included. Small pets with non refundable pet deposit. No smoking. Highway 270 to Lewis and Clark Blvd/MO-367 S to right onto Alexandria Pl Dr to the first right onto Westfall Lane to property.